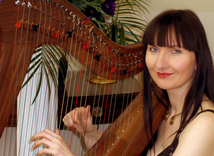 Alongside being a harpist Ramona sings and plays the fiddle, Irish whistles and mandolin in various folk bands in Kent including Camine, Acoustic Paradise, Selkie, Longstone and barn dance / ceilidh band Bowstring. She has also played with famous Kent folk musicians Tim Edey, Brenden Power and Penguin Cafe Orchestra's Geoff Richardson. 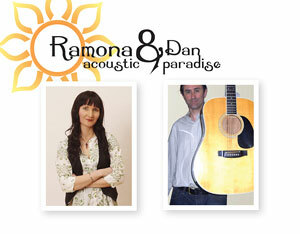 Ramona has performed live and recorded with Tim Edey: virtuoso guitar and melodeon player from Broadstairs. They played their first gigs together, along with Irish singer Enda McCabe, when Ramona was a student and Tim still at school! Tim Edey is a truly unbelievable musician and composer, constantly in demand for recording projects and touring worldwide. He has played with the likes of: Lunasa, Sharon Shannon, Michael McGoldrick, Mary Black, Seamus Begley, Steve Cooney, Altan, Christy Moore, and Brendan Power to name but a few. Tim won BBC Radio Two Folk Awards Musician Of The Year 2012, as well as securing Best Duo with Brenden. Well done Tim! In 2004 Geoffrey Richardson and Francis Kendall approached Ramona to develop and record backing vocal arrangements for songs on their album Estella in Lux. She worked with her sister Zinta to create distinctive harmony arrangements. Tim Edey also guested on the album playing melodeon. Recorded and mixed by Geoff, the CD features an eclectic mix of songs and instrumentals, with Francis on vocals, harmonica, banjo and guitar. World renowned multi-instrumentalist Geoffrey Richardson showcases an orchestra of instruments: violin, viola, cello, ukulele, cuatro, guitar, mandola, mandolin, clarinet, harmonica, banjo, whistle, piano, percussion, electric and floorboard (not to mention singing in both English and French). Geoff has played with seminal Canterbury folk rock band Caravan and nu-classical/folk/minimalist band Penguin Cafe Orchestra. He has also toured with Murray Head, Bob Geldof and Renaud. Ramona also plays music with Geoff and Fran for storytelling sessions with Tony Edwards. When Ramona and Geoff set up their multitude of instruments, the sight is an Aladdin’s Cave, stimulating the children’s imaginations and producing rich combinations of harmony and texture. In 2006 Ramona became involved in The Margate Exodus project when she was invited to create a new arrangement of a specially commissioned song by Laurie Anderson: The Death of Livestock and to perform it to an audience which included Laurie Anderson and Brian Eno. The concert at The Winter Gardens marked the culmination of Exodus Day following the dramatic burning of Anthony Gormley’s 25 metre sculpture – Waste Man. Avant-garde performance artist Laurie Anderson first became widely known outside the art world when ‘O Superman’, 1981, reached no. 2 in the UK pop charts. She also directed and starred in 1986 film ‘Home of the Brave’. She experiments with words and sound, manipulating her voice using pitch shift to explore the relationship between gender, politics and identity. In 2005 Dr. Beau Webber of KentFolk created a unique event a showcase of some of the South Easts best fiddlers, in the wonderful Littlebourne Thatched Barn. The concert was central to a long weekend of events called Fiddlers Various. The aim was to present an evening of varied fiddle styles from around the world played by excellent players of each genre. The 7 fiddlers featured were: Yves Langlois, Ramona Egle, Ben Paley, Ian Cutler, Saskia Tomkins, Chris Wood and Laura Target. Ramona played a set of duets and trios, tunes from: Ireland; England; Brittany; Sweden; Bulgaria and one of her own compositions Tamarind. She was accompanied by multi-instrumentalist Chris Taylor, guitarists Chris Sadler and Zinta Egle and virtuoso bodhran player Steáfán Hannigan. She was joined by Ben Paley to play the beautiful Vallpigan a tune full of intricate harmonies true to the Swedish fiddle style. is touched by a jazzy lilt which echoes Billy and Ella. The song arrangements bring together an impressive sweep of talented musicians featuring a fantastic blend of instruments and styles which echo the myriad of influences which have shaped Katie Bradley’s own distinctive vocal sound. Ramona sensitively interweaves counter-melodies and harmonies using mandolin, violin and voice, to bring out the individual character of each of the songs. 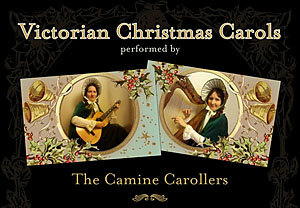 Arrangements from the album were performed live at The Gulbenkian Theatre, Canterbury, and also at The Horsebridge Centre, Whitstable. Lee performed in Germany and the UK in addition to touring with Foreigner in his country of origin, South Africa, before making the decision to focus on his own song writing. Signed to Rich Mr Sax Records, Lee approached Ramona in 2007 to write and record violin parts for his EP. She appears playing fiddle in the music video made for the title track The Best In Me. 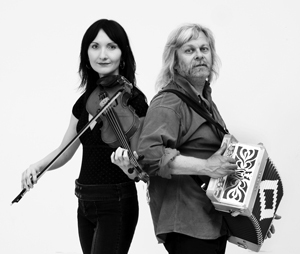 Simon commissioned Ramona to write and record instrumental parts on fiddle, low whistle and harp for his CD: The Less Blessed. Ramona played some tour dates with the Simon Hopper Band for the album launch in 2008, and occasionally gigs with the ensemble. His songs narrate personal experiences and comment on political issues. In 2010 Simon and Ramona appeared on Sky TV, being interviewed and performing a live version of his song Olive Tree on a programme called Remember Palestine. 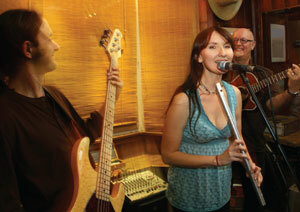 A fiery, fun mix of Folk, Country, Roots Rock, Rhythm & Blues and Carribean. them in rhythmic tow with funky djembe / congas & vocals is Kevin Richards. This motley crew are sometimes joined by extra wandering minstrels who create even more musical mischief and gatecrash the party in a variety of styles! Additional musical stowaways include: Ramona Egle fiddle / whistle / mandolin & vocals, Dan the Man bass guitar and Andee Price dbl bass and vocals. Ramona performed with Irish storyteller Kate Corkery for a special St. Patrick’s evening celebrating Irish culture and music. The event was hosted by ‘Telling Tales’s storytelling club at the Hastings Arms, Gillingham on March 15th 2011. Ramona played ethereal airs on low whistle and Celtic harp to set the scene for the theme of the evening: Shape shifting stories from Ireland. Jaunty jigs and reels entwined with tales of mischief and enchantment drawn from the rich reservoir of Irish folklore. Originally from County Cork and resident storyteller of the Irish Cultural Centre in Hammersmith, London, Kate is an Irish storyteller with a background in language, teaching and performance. Following on from the success of their sell out show, Kate and Ramona are discussing a recording project together. In 2004, The Anchor Inn at Wingham hosted the debut performance of Adrian Sullivan and Ramona Egle’s audio-visual work Earth Poem: a rich tapestry of engaging storytelling, evocative music and breathtaking imagery. In 2006 Ramona was invited to record a track for a collaborative CD: The Weaving, Adrian O and Friends. Adrian weaves the spoken word with musical improvisations and traditional airs contributed by musicians from the East Kent folk scene. Founding member of this famous Kent folk band Jacobs Ladder. Ramona’s musical career was launched through the formation of Jacobs Ladder whilst she was studying at art college in Canterbury. Beginning as a trio in 1994 with a line-up of Ramona, her twin sister Zinta, and Andy R, Jacobs Ladder quickly forged a solid reputation in Kent for musical individuality and song writing skills. By 1996 they had been joined by Simon Marchant and Hugh Wisdom. The fusion of diverse musical backgrounds produced a unique sound, earning them a devout following and a reputation as a live band not to be missed. 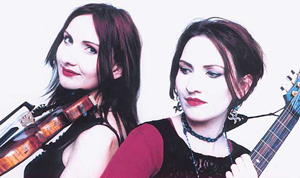 Ramona and Zinta’s original songs flavoured with their unique harmonies; fretless bass; electronic effects; marimba; flutes (including Norwegian shepherds’ flute); violin; whistles; harp and percussion all featured in the esoteric mix. 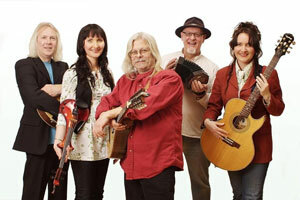 1998-99 saw them performing extensively, ranging from top London venues such as The Mean Fiddler and Weavers, through to rural touring and a more grass roots approach of taking music out to the community and utilising local venues such as village halls. They also launched their highly acclaimed album Kite.